Located just outside of Belleville, Ontario we provide fresh, Ontario farm raised, human grade raw meat for your beloved pets in convenient sizes. We keep our prices as low as possible to make raw feeding an affordable option for your pets. 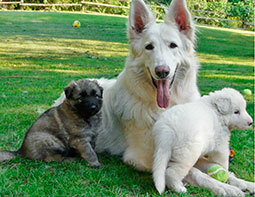 At Genesis we are Shiloh Shepherd breeders who know first hand the benefits to raw feeding. We raise our own dogs on our raw diet that consists of meat and bones and includes chicken, turkey, beef, tripe, duck, pork, fish and eggs. Our products have all been tried and tested on our own dogs and pups who give it the stamp of approval. With all the issues in the news lately with dog foods and recalls, feeding your dog a natural diet gives you peace of mind that you know exactly what they’re getting. The benefits to raw are many and varied and include a species appropriate diet, less or no doggy odour, smaller, firmer stools that turn chalky after a couple days, appropriate rate of growth for puppies, naturally clean teeth, and less occurrence of allergies and kibble related issues, not to mention your dogs will love it! If you are not familiar with a raw diet or the barf diet please read through our site and the many links to discover for yourself the many benefits to you and your furry family.